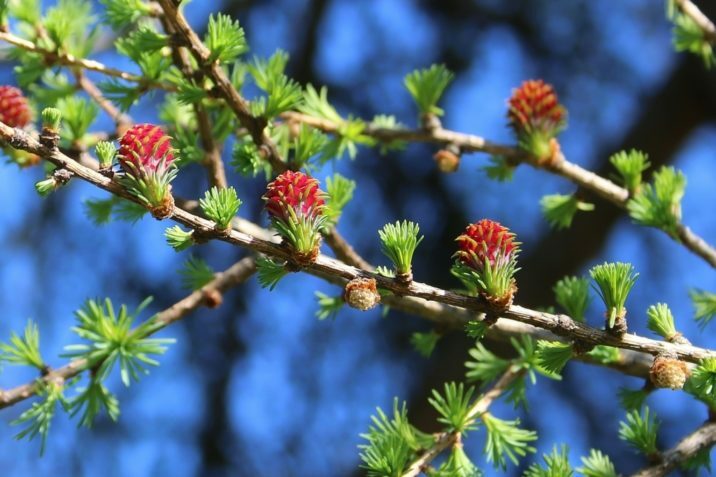 Larix kaempferi, as described in 1856 by (Lambert) Elie-Abel Carrière (1818–1896), in Journal Général d'Horticulture, 11th ediion, is commonly known as Japanese larch; as well as カラマツ (Karamatsu) in the Japanese language. The species name honors Engelbert Kaempfer (1651 - 1716), one of the first European botanists to visit Japan. Ethnobotany. 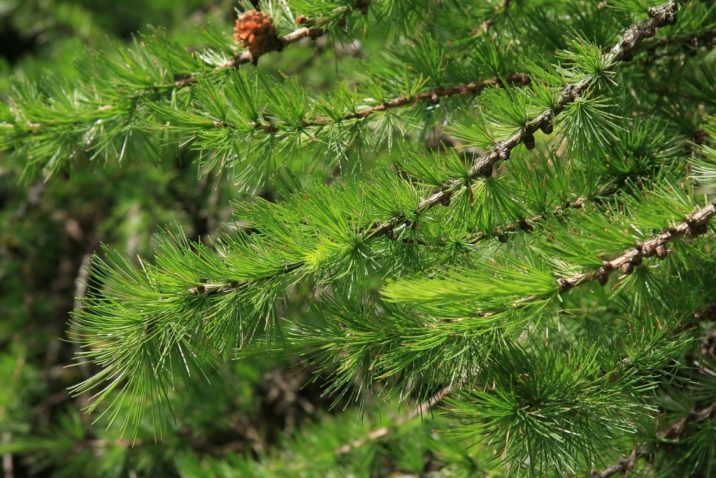 Japanese larch is an important tree in forestry plantations, being grown throughout central and northern Japan (north to Hokkaidō), and also widely in northern Europe, particularly Ireland and Britain. The wood is tough and durable, used for general construction work. 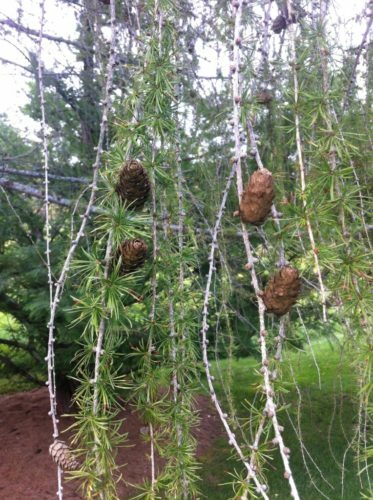 Small larch poles are widely used for fencing. Artwork by Philipp Franz von Siebold and Joseph Gerhard Zuccarini, 1870 from Flora Japonica, Sectio Prima (Tafelband). Description. 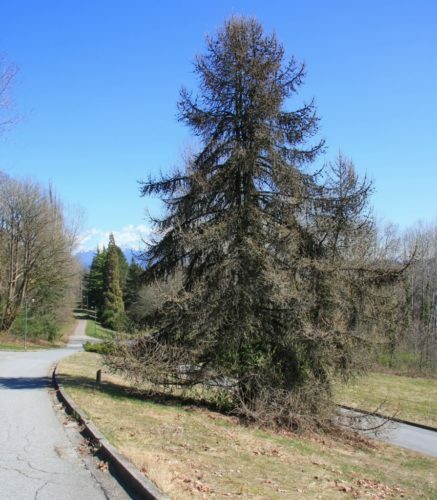 Japanese larch is a deciduous coniferous species of tree that grows to heights of 120 feet (40 m) tall with a trunk width of 7.5 feet (150 cm) in diameter measured at breast height, but may be much smaller at high elevations. Trunks are round, straight, with long, horizontally spreading first order branches, and short, slender, drooping second order branches. Crown is conical, dense, becoming irregular and more open with age (or on exposed sites). 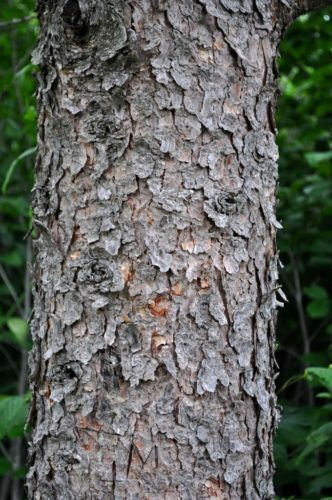 Bark is smooth and red-brown on young trees, becoming first scaly and later fissured, dark brown in color when young, weathering to gray with age. 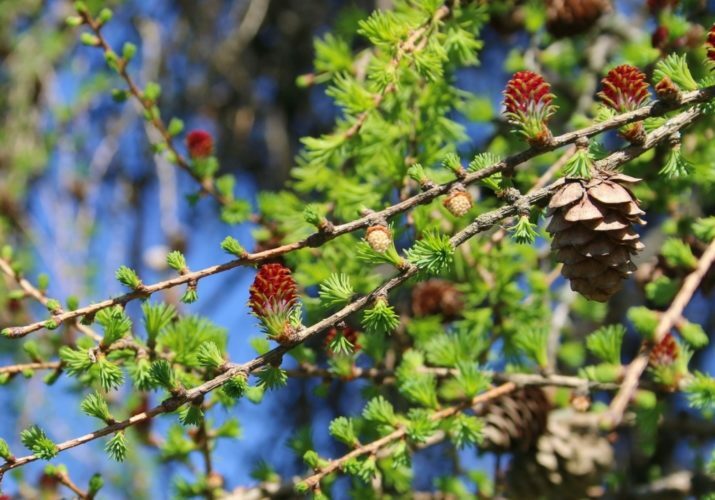 Branchlets are of two kinds, as in all Larix species. The long shoots are slender, flexible but not drooping, pale yellowish brown in color, smooth between prominent grooves, glabrous or slightly pubescent, with weakly developed pulvini at the ends of the ridges. Short shoots are 0.08 to 0.28 inch (2 - 7 mm) long and circa 0.12 inch (4 mm) across have traces of scales crowded into one to seven rings. The terminal vegetative buds are conical, 0.16 to 0.2 inch (4 - 5 mm) across, while the lateral buds are sub-globose and 0.12 inch (3 mm) across. Both are slightly resinous with dark red-brown triangular-ovate bud scales having erose margins. Leaves are deciduous, gray or Blue-green in color, turning bright yellow in autumn. They are spirally arranged on long shoots, to 2.4 inches (6 cm) long and 0.08 inch (2 mm) wide. On short shoots they are spirally arranged in radial clusters of 20 to 35, linear, widest above the middle, flat, with an obtuse apex, circa 0.92 inch (23 mm) long and 0.032 inch (0.8 mm) wide, with stomata in several lines above, and in two narrow bands separated by a midrib below. In cross section they are diamond-shaped with 2 small lateral resin canals. 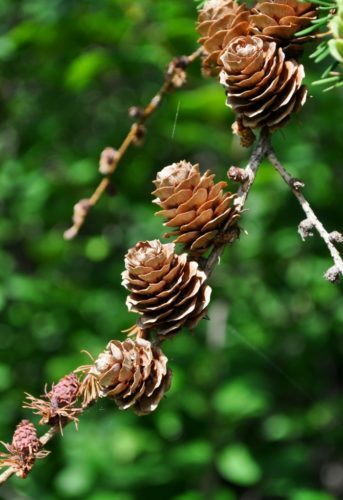 Pollen cones are produced terminally on short shoots, often clustered on short branches, ellipsoid in shape, yellow-brown in color, with numerous bracts at the base, short-stalked, 0.2 to 0.24 inch (5 - 6 mm) long, with numerous stamens. Flowering occurs from April to May. 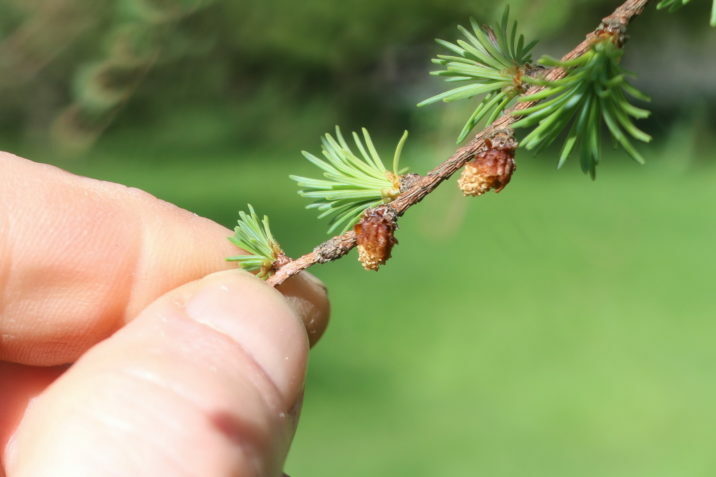 Seed cones are erect, terminal on short shoots, with short, curved, pustulate peduncles. They are broadly ovoid shaped with a blunt apex, 0.8 to 1.2 inches (2 - 3 cm) long and 0.8 inch (2 cm) across when scales open. The immature seed cones are violet and the bracts have a green midrib. 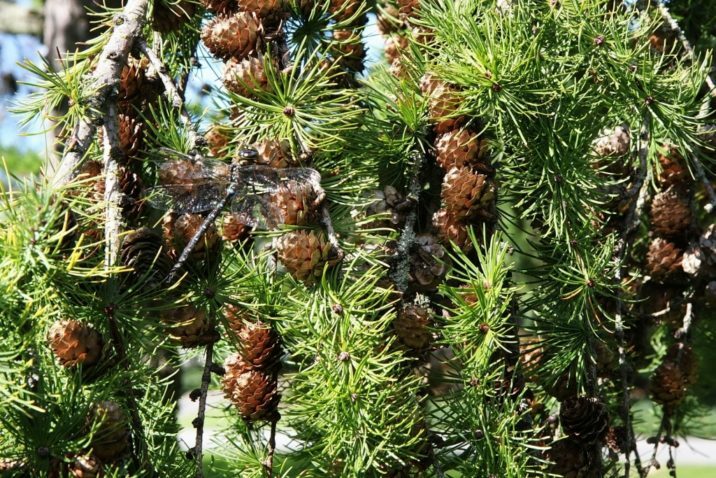 They mature in October to a yellow- or orange-brown color, turning dark brown when old, and are are persistent on the tree, falling long after the seeds have dispersed. 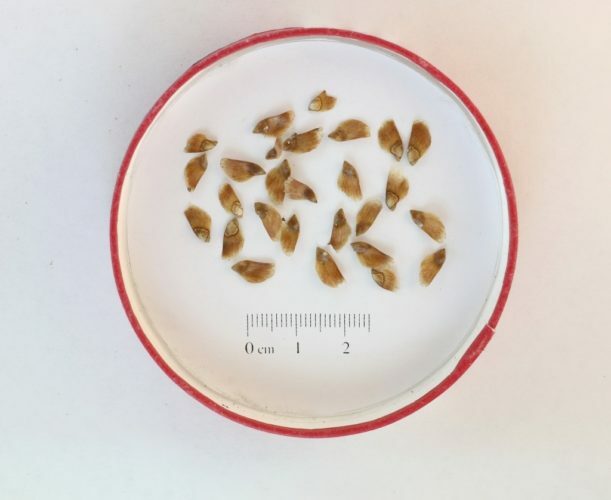 Seeds are slightly flattened, obovate or triangular-obovate shaped, gray-brown in color, mottled with red, circa 0.16 inch (4 mm) long and 0.12 inch (3 mm) wide, with pale brown oblong-obovate wings 0.2 to 0.32 inch (5 - 8 mm) long and 0.12 to 0.16 inch (3 - 4 mm) wide. Distribution. This species is native to Japan: central Honshu island, from Kaga Province in the west to Shimotsuke Province in the northeast. It grows on mesic sites, at elevations of 3,800 to 8,600 feet (1,200 to 2,700 m) above sea level, reaching its altitudinal limit on the south face of Mt. Fuji. 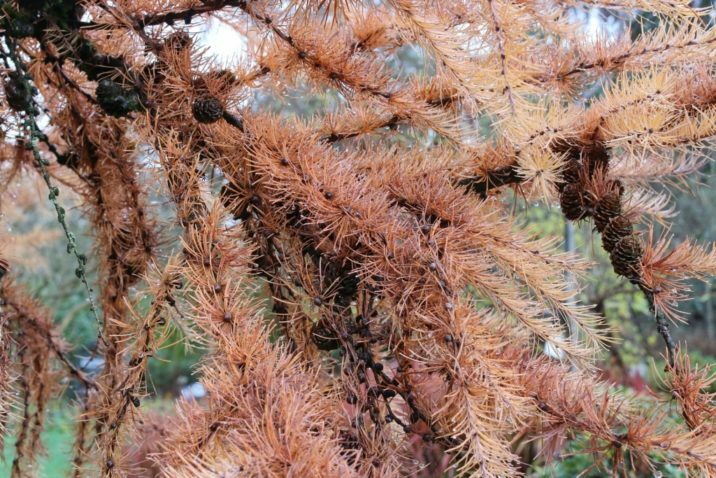 Unlike the other northeast Asiatic larches, it naturally occupies better soils, often of recent volcanic origin, and is never found on peat. The climate is cold, with snowy winters and abundant rain in cool summers. 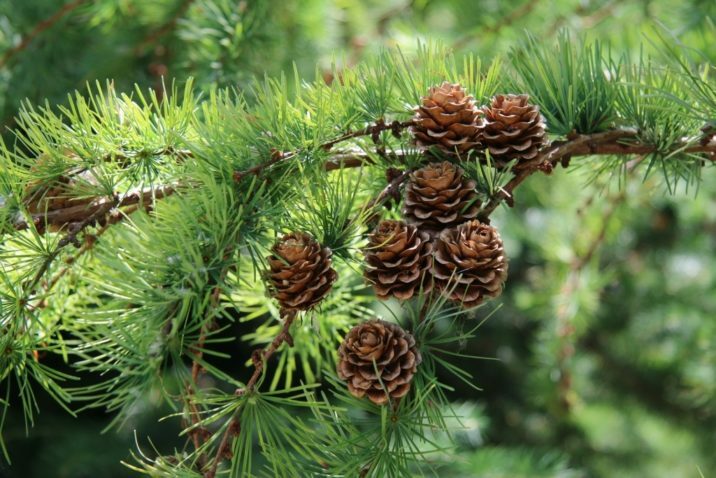 It is commonly found in association with other conifers, e.g. 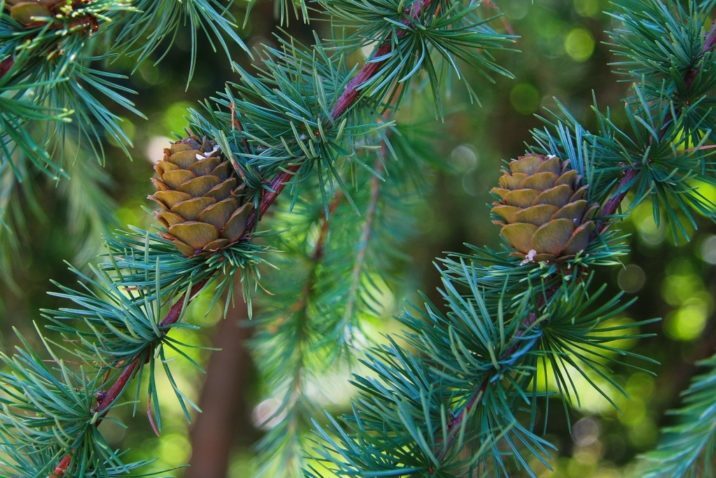 Pinus densiflora, Picea jezoensis ssp. hondoensis, Tsuga diversifolia, Abies homolepis at lower elevations, A. veitchii at higher elevations, but it is clearly a sub-climax species. 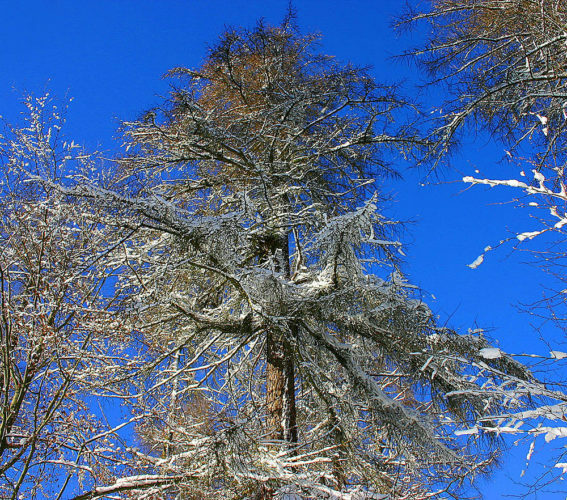 Pure 'scrub stands' (krummholz) may occur at the upper limit of trees. The holotype was collected at Japan's Nagano prefecture. Hardy to USDA Zone 4, cold hardiness limit between -30º and -20ºF (-34.3° and -28.9°C). Attribution from: Farjon, Aljos. 1990. 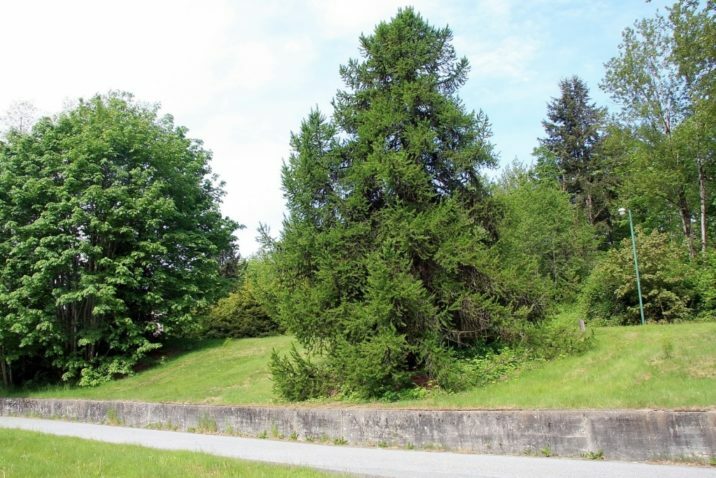 Pinaceae: drawings and descriptions of the genera Abies, Cedrus, Pseudolarix, Keteleeria, Nothotsuga, Tsuga, Cathaya, Pseudotsuga, Larix and Picea. Königstein: Koeltz Scientific Books. 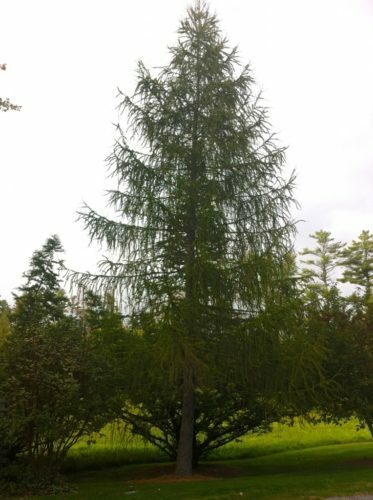 An approximately 20 year old Japanese larch (species) photographed in Freeport, ME, 2013. 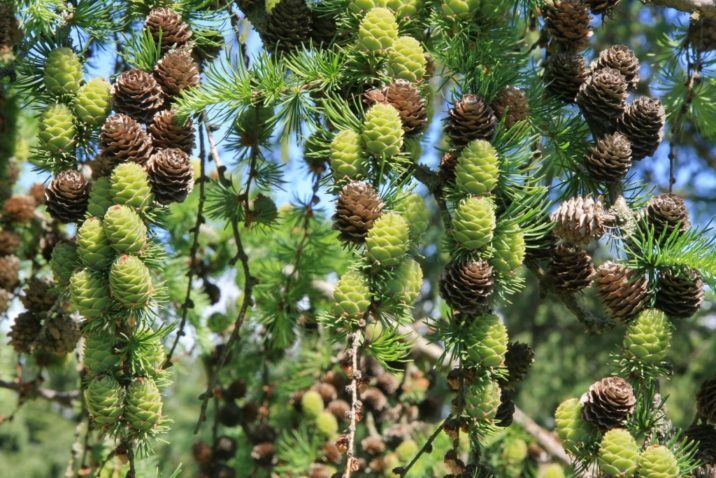 Mature (last season) Larix kaempferi cones photographed on 20+ year old species tree in Freeport, ME, in the fall of 2013.
a 100-year-old Japanese Larch (Larix kaempferi) on the Spitzberg in Suhl in Germany's Thüringer forest. 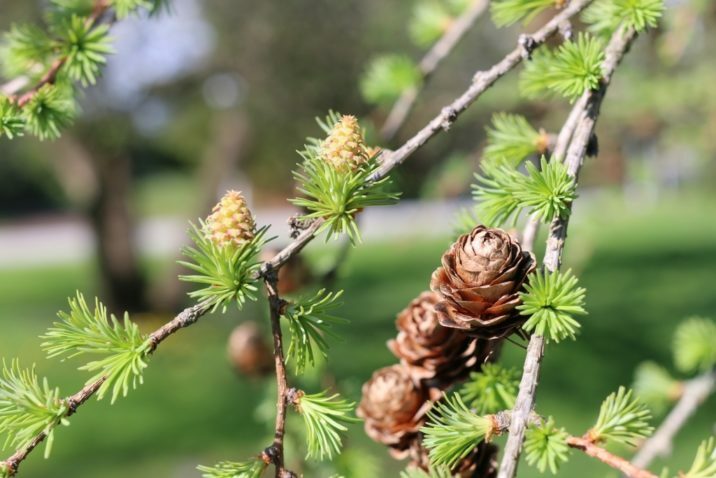 Larix kaempferi — open cones; photograph provided by Susan J. Meades. 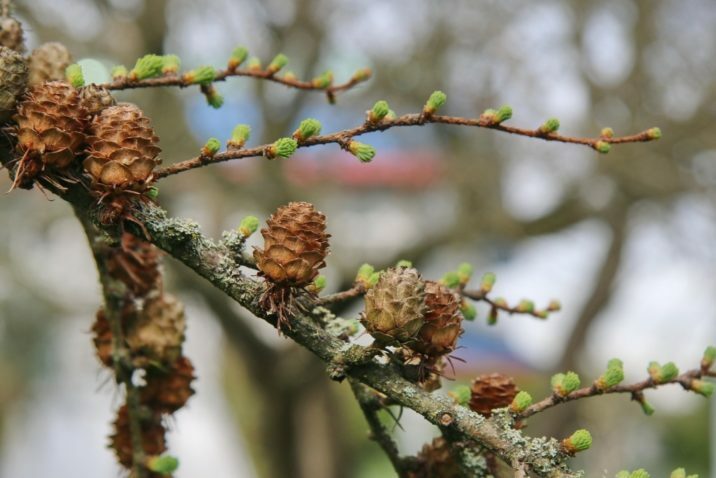 Larix kaempferi — scaly bark. Photo from Susan J. Meades.